Lilongwe (Malawi), Jan 8 - From reminiscing about his days in Delhi to his fondness for bhangra, the president of the small, land-locked southern African nation of Malawi praised Indian education, pointing out that he was a "product of India." 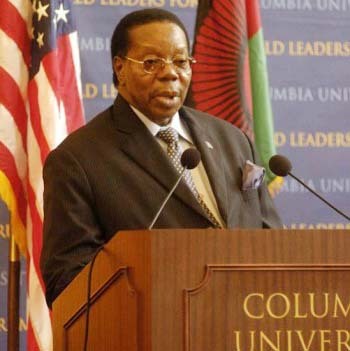 "I consider myself a Delhiwala," said Malawian President Bingu wa Mutharika, who had completed his graduation and masters degree from Delhi University in the 1960s. He was speaking Thursday night at the state banquet organized in honour of the visiting Indian Vice President Mohammad Hamid Ansari. "I am myself a product of India," asserted Mutharika, who had been re-elected for asecond time in 2009. He urged more cooperation from India is the education sector, citing his own success story. He said that the five years of study were continuous without a break to return to Malawi. "That was because as a student I was always broke and didn't have enough to come home". Then, during the holidays, he travelled extensively in India in all the regions from Jaipur to Chennai. Mutharika returned to Delhi for a short trip of 13 days in 1994. Ansari invite him to visit India to "see how much India has changed since your college days in New Delhi four decades ago". The state banquet was held in a massive white tent in the lawns of a hotel in Lilongwe, after the earlier scheduled venue of the State House lawns were washed out due to heavy rains.